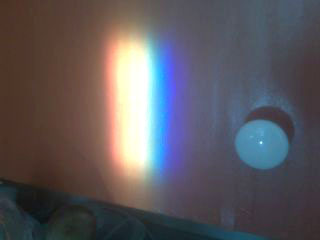 I was making a late lunch today and saw this bright prismatic image on a cabinet. It was coming off our glass-topped stove, but originated from the afternoon sun hitting a 3-sided little flower vase in the window sill. The image only lasted a few minutes, so I grabbed my cell phone to take this photo. This doesn’t quite do justice to how vivid it was, even if only briefly.